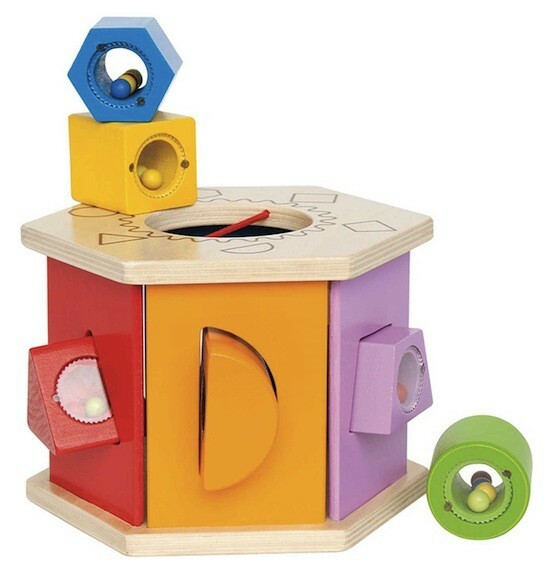 The Shake n Match Shape Sorter from Hape is a 6-sided wooden shape sorter with colorful sides, different shaped holes, and stretchy orange elastic to move for retrieving pieces from the top or bottom. This sorter also includes 6 wooden geometric shapes that are filled with colorful beads for visual stimulation and noise-making play. Wooden shapes include a circle, square, trapezoid, triangle, star and half circle, all in great colors.